Get to know more than 2500 new words with this course! Do you want to speak Spanish like a local? Say what you want to say with our Spanish B2 vocabulary course which includes over a 1000 Spanish words . Learn new Spanish nouns, verbs and adjectives to achieve Spanish B2 level quickly and become fluent and proficient in no time . 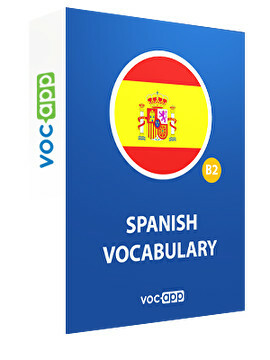 Use our Spanish vocabulary flashcard to learn advanced vocabulary and improve your Spanish! Did you know that more than 400 million people speak Spanish language? Be on the same wave with them using our Spanish vocabulary flashcards and get from beginner’s level to Spanish B2 . Our course contains over a 1000 Spanish words for you to use in a conversation on and topic . Learn Spanish verbs, nouns and adjectives efficiently and memorize them forever to get your B2 level! Our course gives you access to over a 1000 Spanish words that will get you to Spanish B2. You can learn Spanish verbs, adjectives and nouns with picture associations and make sure you pronounce everything right with MP3 recordings. Spanish language has never been so easy.